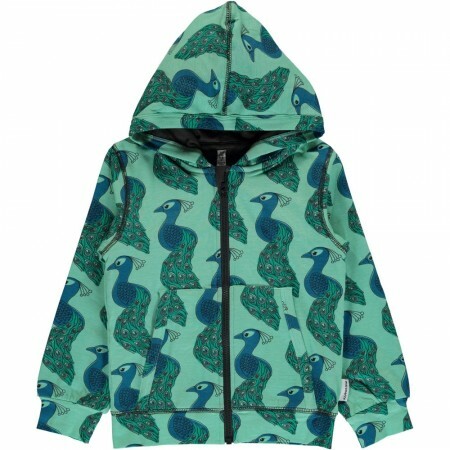 This organic cardigan features the Maxomorra Explore Peacock print on a pale green background. The peacocks on this print will make sure your kids look great and stand out from the crowd. The cardigan is made from organic soft cotton and has a lined hood, it features a zip down the front, ribbed cuffs and waist and side pockets. Perfect as an extra layer when things get chilly. Made from knitted double layer jersey fabric which is 95% GOTS certified organic cotton and 5% elastane.